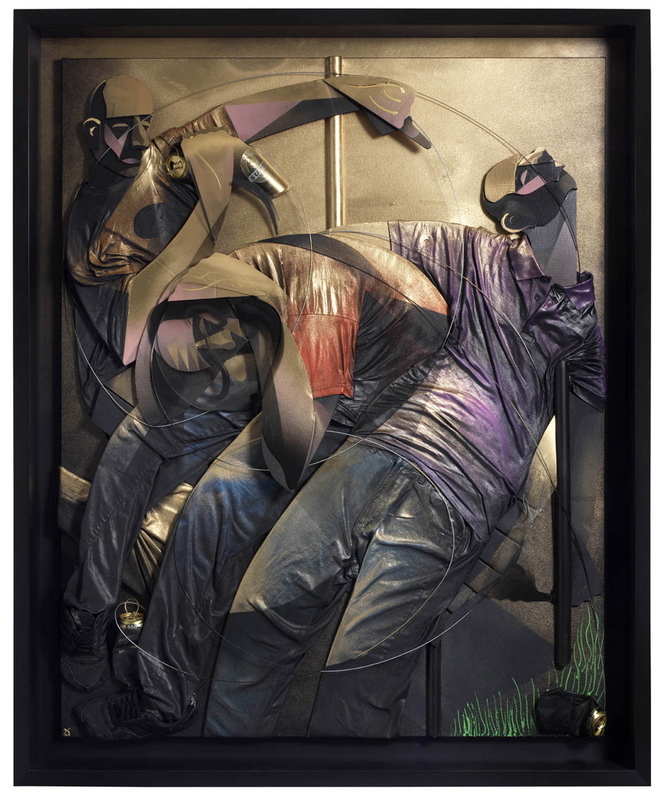 Adam Neate - The Three Stages. Photo via Elms Lester. Arrested Motion (AM): Congratulations on the new show. Can you tell us more about how this latest body of work came about? Adam Neate (AN): Last year, I had a mental breakdown and lost my mind. My world fell apart and I had to slowly rebuild my thinking about everything. The brain is just another muscle and I had used it too hard. I held on to my art with my teeth and slowly used it to pull myself up again. To rebuild from the foundations I began to ask simple questions: Why do I do art? What is art for? I would start each painting asking a number of questions and hopefully try and resolve/or find answers within what I created. AM: One of the things I love about your work to date is your willingness to consider, explore and express the dark side of human nature, emotions and relationships. Is this something that you’re continuing to pursue in your new work? AN: All that stuff comes as a result or by-product. The main driving force in my work is creativity and its process of deconstructing and analyzing the direction of creativity – the modern day shamanic process of absorbing the world and the present and channeling ideas of newness into a tangible reality for others to see in a way that may pave our future thinking. AM: What other issues are finding their way into your work at the moment? AN: Capturing moments in time, in the way that photography will never be able to. AM: We’re familiar with your amazing use of cardboard and have been really excited by the preview pictures we’ve seen from “A New Understanding” as it looks like you’re really blurring the boundaries between painting and sculpture with your use of found materials like cardboard, metal and perspex. How have you been developing this technique and are all the pieces for this show “framed” in the traditional sense behind glass or are there any free standing pieces? AN: There are a few free standing pieces (i.e. not framed). I wanted to combine installation art with sculpture and painting. The framed pieces to me are like encased installations. I always felt there was a large void in the art world between the traditional paint on canvas and the newer installation art. I wanted to fill that gap. I wanted to learn to paint with fabric and sculpt with paint. I wanted to develop a language within a language. 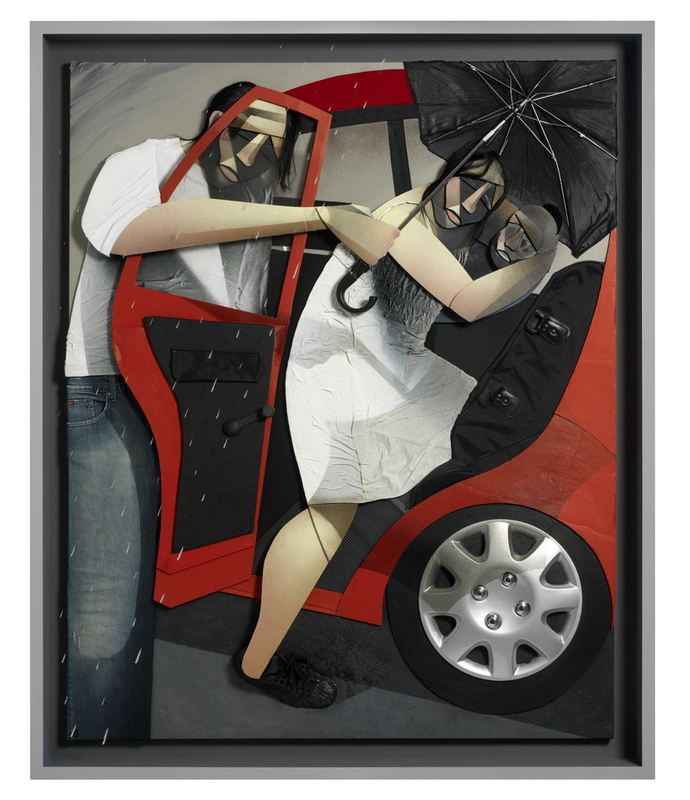 Adam Neate - Family Circle. Photo via Elms Lester. AM: Can you tell us about your favourite piece from the show, how it came about and why its your favourite? AN: I guess my newer 4-dimensional studies. Without my mind doing what it did, I most probably would never have found this path/direction. It’s a beautiful path to follow and kind of like walking across 10 inch deep fresh snow.Â You know there’s a solid road under the snow, but you can’t feel it for enjoying the journey of walking. AM: How do your ideas for pieces typically develop into finished works of art? Can you let us in to some details of your creative process? AN: Art is one of the most extremely beautiful maths equations we witness in life, next to music. If you can learn to deconstruct what is known as reality and reconstruct it in your own unique language for others to see, hear, and interpret with their own unique sensations and feelings, giving a connection between one human to another – then an “art form” has been achieved. Without humans, art would not exist and some may say the opposite may apply too. AM: With your tradition of leaving work for others to find and take from the street and the more recent London print drop, how do you adapt to the far more controlled and commercial environment of a gallery space?Â Do you miss the thrill of leaving work for others to find and have you been doing any outdoor work recently – whether on walls or left for others to find? AN: My years of painting in the streets was kind of my art education. I used it to learn about color, composition, lines, meanings and styles. The wilderness years… The wild years. I learned to strip art down to the inner child, the caveman, the drunken animal, the ugly, the raw. To come as close to purity within art as possible. AM: Did you personally put any of the pieces out for the London print drop and, if so, how did it feel? AN: Yeah I did. It felt like I was saying goodbye to that time, like a farewell party. Old ghosts were exorcised as well as my feet. 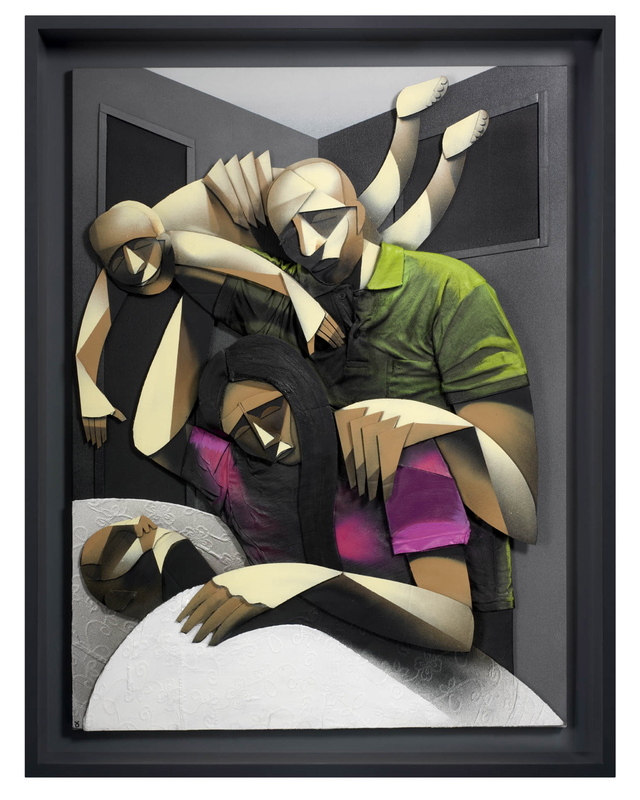 Adam Neate - Family. Photo via Elms Lester. AM: Are there any more print releases planned – whether through a gallery or directly onto the streets? AN: Not at the moment. AM: I understand you now spend much of your time in Sao Paulo. How is the art scene there and how has your time there influenced your work? AN: The scene out there is good. In London, you are spoiled rotten for art and culture to see. In South America, the artists have to have an unbelievable amount of drive and creative hunger to exist as an artist. AM: If you could collaborate with one artist – whether living or dead – who would it be and why? What do you think you would you make with them? AN: Anish Kapoor… I always say it’s nice to be important, but it’s more important to be nice. The guy has such a beautiful inner energy about him and it reflects tenfold in his work. I would be happy making a cup of tea for the guy as a project! Hearing him talk about what his work means to him made me cry. AM: What’s inspiring you at the moment? AN: Richie Jackson – To take an art form and completely create his own unique language to almost re-invent itself and to become a true individual. AM: What’s worrying you at the moment? AN: I can’t allow myself to worry too much or it all falls apart again. AM: Many thanks and good luck with the final show preparations – we can’t wait to see it! Side note: Elms Lester will be releasing a book (limited edition of 1000 copies) for the show priced at Â£45.00 and Neate will be on hand on Saturday, October 10th (11am – 1pm) signing copies. Categories: Art, Contemporary Art, Features, Interviews, Previews, Shows & Events, Street & Urban Art. 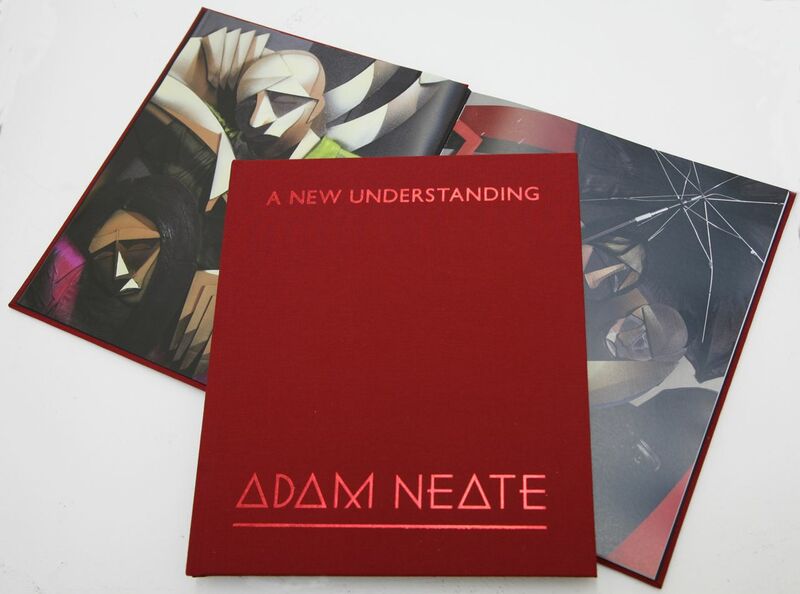 Tags: Adam Neate, Contemporary Art, Features, Interviews, Neate - Elms Lester 09, Shows & Events, Street & Urban Art.